Identification: Moyle (1976a); Wydoski and Whitney (1979); Sublette et al. (1990); Page and Burr (1991); Bond (1994). It is considered a species complex; some subspecies are protected as endangered (Page and Burr 1991). Gilbert (1998) recognized 15 subspecies. One subspecies is R. o. nubilis from Washington and closely adjacent areas, sometimes reported as Rhinichthys nubilus (Miller 1952). Native Range: Western drainages (Pacific and endorheic) from Columbia River, British Columbia, to Colorado River, Arizona and New Mexico, and south into Sonora, Mexico (Page and Burr 1991). Table 1. States with nonindigenous occurrences, the earliest and latest observations in each state, and the tally and names of HUCs with observations†. Names and dates are hyperlinked to their relevant specimen records. The list of references for all nonindigenous occurrences of Rhinichthys osculus are found here. Means of Introduction: Several transplants into parts of California during 1939 and 1940 were considered experiments to test the effects of changed environment on meristic and morphometric characters (Miller 1968). 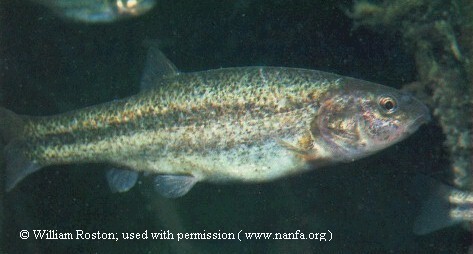 This species was intentionally stocked by Nevada Fish and Game officials in Ruby Marsh-Ruby Lake complex as forage for introduced largemouth bass Micropterus salmoides; the first introduction, in 1950, involved R. osculus robustus from a headwater of the Humboldt River, and the second, in 1951, from nearby Diamond Valley, Eureka County (La Rivers 1962; Hubbs et al. 1974). Although La Rivers (1962) recognized that R. osculus robustus was native to the Truckee River system, he concluded that the high-altitude lake had no native fishes and that small fishes present in the lake had likely arrived as a result of being stocked along with trout. Introductions of this species in other areas were probably the result of bait bucket releases (e.g., Miller 1952; La Rivers 1962). For instance, Miller (1946) indicated that the presence of Rhinichthys osculus in the Santa Clara River system (California) was possibly the result of its introduction as bait by trout fishermen. Status: Established in San Luis Obispo Creek and Webber Lake, California (Moyle 1976a), and in Ruby Marsh, Nevada (La Rivers 1962). Reported from New Mexico (Sublette et al. 1990). Fishes introduced into Willow Creek and the Old Borax Works of California failed to survive; however, the species was common at River Springs, California, in 1967, more than 25 years after its initial introduction (Miller 1968). Although Miller (1968) reported on its occurrence in the Santa Clara River system, California, Bell (1978) did not collect the species there. Impact of Introduction: Unknown in introduced areas. Speckled Dace are known to hybridize with least chubs Iotichthys phlegethontis (Sigler and Sigler 1987), a species under review for federal listing, and therefore present a threat to this rare species. Remarks: Widely used as a baitfish in certain parts of the western United States (Miller 1952; La Rivers 1962; Baxter and Simon 1970). Contrary to Moyle (1976a), Miller (1968) and Bell (1978) believed that R. osculus is native to San Luis Obispo Creek. They based that conclusion on Jordan (1894), who included this species under the name Agosia nubila in his early list of fishes found in San Luis Creek. Miller, R.R. 1952. Bait fishes of the lower Colorado River, from Lake Mead, Nevada, to Yuma, Arizona, with a key for identification. California Fish and Game. 38: 7-42. Miller, R.R. and J.R. Alcorn. 1946. The introduced fishes of Nevada, with a history of their introduction. Transactions of the American Fisheries Society. 73: 173-193.